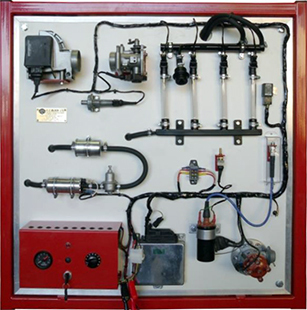 Fully operational Fuel Injection/Engine Management Trainer, manufactured using components from original engine build. The system comprises all the elements that control the air-fuel ratio and the ignition timing, together with the ECU and all the sensors associated with the control system. Variation of the engine speed will allow the measurement of parameters within the system that are speed dependent. This is achieved by changing the rotational speed of the electric motor that drives the unit. The system also includes a range of switchable faults (10) for diagnostics training. (DRY) Dry running operation using LEDs to indicate injection operation. (WET) Wet running operation using original fuel pump allowing observation of the fuel flow through the injectors (white spirit). Fitted with manufacturer diagnostic socket (10 pin).